Warm-blooded mammal in the rodent family. Nocturnal—up at night, sleeps during the day. There are many types of hamsters, but only a few types are kept as pets. The hamster is the most popular of the smaller rodents kept as a pet in many countries today. Unlike the mouse, a hamster is virtually tailless. The most popular variety of hamster kept as pets and used in laboratories, are the golden (Syrian) hamsters. They come in cinnamon, cream and white. Goldens also come in the longhaired variety called "teddy bear" hamsters. Hamsters make good beginner pets, as they are fairly easy to care for. They often have docile temperaments and have relatively clean habits. Hamsters are friendly and when handled often, they become quite tame. They are delightful to watch as they go about their daily housekeeping, food storing and exercise on their wheel. Some will show acknowledgement of their owners, eagerly looking for treats when approached. A hamster that has not been handled enough while young may not be as friendly and may not wish to be held and may even bite. Whereas a hamster that has been handled frequently from a very young age usually remains docile and rarely bites. Those with docile temperaments and a history of not biting can simply be picked up by using one or both hands, and then held in both hands or in one hand holding it against the body. Be sure to pick a hamster with a good temperament. If you suddenly grab or startle the hamster, it may bite, and the bite may draw blood. 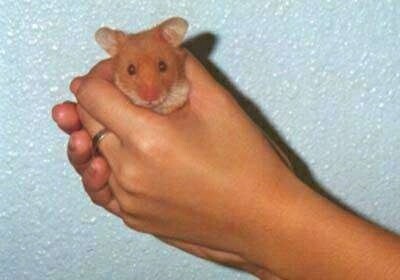 Hamsters should be gently handled, scooping them up and cradling them in the palms of your hands. The more a hamster is gently handled the tamer it will become. Many hamsters develop untrustworthy personalities and begin to bite because they have been handled roughly or suddenly disturbed or awakened. Caution should be used when approaching a hamster with an unknown personality. You can wear gloves or gently wrap them in a small towel to pick them up. You can also encourage them into a Tupperware container to remove them from their cage. Hamsters that are known to bite and those with unknown personalities can also be picked up by the skin on the back of their neck. Hamsters have very loose skin, so be sure to get a lot of skin using your thumb, middle and index fingers, because a hamster can turn all the way around and bite the person’s hand. Black Bear and golden hamsters are the easiest to tame. Hamster temperaments vary from breed to breed and depending on where you buy your hamster. In a lot of cases the hamsters in the pet stores are mass produced without any thought to temperament or health. For this reason you may want to consider looking into a hamster breeder or digging deep as to find out the origins of the pet store hamster. The hamster is nocturnal, meaning they are up at night and sleep during the day so keep in mind they may make noise at night with their gnawing and rustling around their cage. Hamsters have large incisor teeth that continually grow. They need to gnaw on things to wear down the teeth to prevent them from overgrowing. They have very poor eyesight but a keen sense of smell and excellent hearing. The Syrian (or golden) hamster, cannot be kept with other hamsters after 8–10 weeks of age. 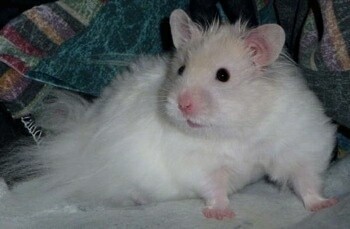 They may viciously fight, resulting in either serious injury or death, especially two adult female hamsters. Breeding females are larger than males and tend to be aggressive toward them. However the Russian dwarf hamster can sometimes be kept with other hamsters. Hamsters are not as demanding of attention as a rabbit, guinea pig or rat. If the hamster is a child's pet, the child should be taught how to properly handle and care for the hamster. Hamsters should not be allowed to roam free around your house as there are lots of tiny places they can get into and you may have a hard time getting the little guy back again. They also like to chew, so if your hamster is lost for a period of time, it may chew your carpet or furniture. They can also get stepped on and if you have a cat or a dog, a loose hamster can be in great danger. Hamsters cannot see very well and they are not as sure-footed and as some other animals. They can very easily fall off of furniture or tables and can really get hurt. Hamster balls are available in pet stores and should only be used with adult supervision. An adult hamster weighs roughly 90 - 150 gm. They are small, about 3-5 inches (mouse like) and can fit in the palm of your hand. There is a wide variety of cages and housing used for hamsters. Common caging used are 10-gallon tanks, Habitrails, stainless steel and wire cages (some having multiple levels, with a plastic cat litter pan bottom for easy cleaning). Habitrails are fun for the hamsters. You can attach plastic see-through tubes and tunnels, making a great home for the hamster to roam. However keep in mind the more attachments you use the more you will have to clean. Cages should at least be 20 square inches of floor area per hamster, and a cage height of at least 6 inches. Since hamsters like to sleep during the day and are up all night you may want to keep the hamster cage in a living room or den rather than a bedroom so the nighttime noise is not bothersome. A wood or plastic house should be provided for the hamster to burrow in. The cage should have solid floors and relatively deep bedding. Plenty of nesting material should always be provided. Toilet paper and paper towel tubes are great things to put into the cage for them to chew on and make their nest. Small cardboard boxes are also great. Common beddings used are toilet paper, shredded paper, processed corn cob, CareFRESH™, Sani-chips®, Gentle Touch™ and wood chips. Cotton or shredded tissue paper (Kleenex) is suitable nesting material. Some use cedar or pine chips, however it is said that neither of these should be used as they contain oils called phenols that can slowly cause liver and kidney failure. Some also say you should avoid any cotton or fiber type beddings sold as nesting material. The fibers do not break down in the hamster’s system and can get caught in their pouches or ingest them while eating. Be sure your hamster’s cage is escape-free. Hamsters are great escape artists! Once free, you may have a very hard time getting them back. 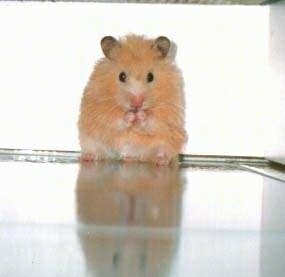 They will chew on your wires, furniture, etc.... Hamsters rarely return to their cages on their own. Hamsters should have their cage cleaned weekly. Un-cleaned cages can get quite smelly. Bedding should be kept clean. Hamsters do not require grooming; they take care of their own grooming needs. Hamsters can be fed hamster mix found at the pet store or grocery store, lab blocks, sometimes called rodent diet or rodent chow, fruits (introducing slowly to avoid diarrhea), Cheerios and bread can be given as a treat as can dog biscuits. Water should always be provided using a hanging bottle (found in pet stores). Bowls and dishes should not be used for water as the hamster will just spill and walk in them getting themselves and the inside of their cage wet. Hamsters have enormous expandable cheek pouches, which they use to carry food and bedding back to their burrow. They will hide a pile of food under the bedding and eat it later at their own leisure. 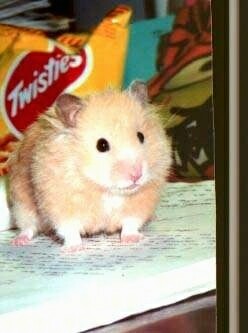 Hamsters should have an exercise wheel in their cage. Give a hamster an exercise wheel and it will take care of its own exercise needs. Hamsters can also be put into a hamster ball which you can put on your floor and the hamster will run around the house inside the ball. Providing long Habitrails (plastic tubes which the hamster can run through) will give the hamster plenty of room to roam around. They enjoy tin cans opened at both ends (make sure there are NO sharp edges) and boxes with multiple openings through which they can crawl. Hardy, requiring few visits to the vet. "Teddy bear" hamsters and other genetic varieties tend to be much more susceptible to disease and sensitive to antibiotics and other drugs than the shorthaired golden hamster. When hamsters are under stress they can get diarrhea, which is called "wet bottom." Wet bottom is diarrhea, which looks almost like pee; shortly after they contract this they usually die. Hamsters are solitary animals and only come together for mating. Golden hamsters have to be separated after mating, otherwise the female may kill the male. 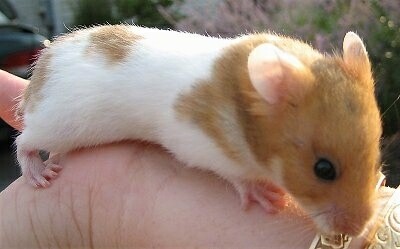 The gestation period of the common hamster is 19-20 days and is 15 days for the golden. They will have 4-12 babies at a time. Hamster babies are called hamster pups. A mother hamster is very maternal, and, if danger threatens, she will carry her babies away, either by putting them into her cheek pouches or laying them across the toothless area of her jaws. Hamster pups should not be touched for the first two weeks as the scent it leaves on the babies can confuse the mother, causing her to abandon or even eat them as she mistakes them for someone else’s babies. The babies are so tiny that you can also accidently hurt them. By the time they are two weeks old their eyes are open and they have a thick coat of fur. Mother hamsters wean their babies at about 3-4 weeks of age and the babies should be separated from the mother shortly after that. A female hamster is capable of having 2-3 litters a year. Hamsters originated in the Middle East and southeastern Europe. The word 'rodent' is derived from the Latin word 'rodere' which means 'to gnaw' and the word 'hamster' comes from the German word 'hamstern' which means 'to hoard' or 'to store', referring to the hamster’s tendency to collect food in its pouches. 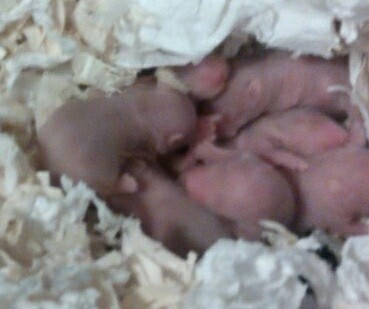 Nine baby hamsters (pups) shown here at 6 days old.